Did you ever imagine the sperm whales sleeping? How would that look like..? If you still can’t picture that, then let the Swiss photographer Franco Banfi help you out. Recently Franco snapped an extremely rare shot of a group of sperm whales in their sleep. He and a team of scuba divers were following the pack in the Caribbean Sea, near Dominica Island, when suddenly the whales stopped moving and went into a synchronized vertical rest. This behavior was first documented only back in 2008, when a team of biologists from the UK and Japan drifted into a group of stationary sperm whales. After studying tagged whales the team found out that this collective nap occurs for approximately 7 percent of the whale’s life, in short stretches of just 6-24 minutes. Franco’s photo “Flying Over the Sleepers” was a finalist in the 2017 Big Picture Competition in the category of Human/Nature. 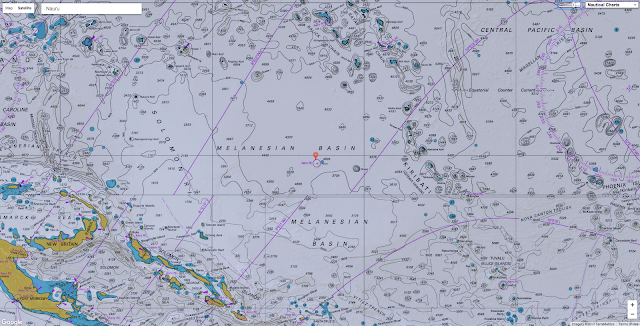 ADMIRALTY Notices to Mariners (NMs) are designed to help you update your ADMIRALTY Standard Nautical Charts (SNCs) and ensure they contain the latest safety critical information. 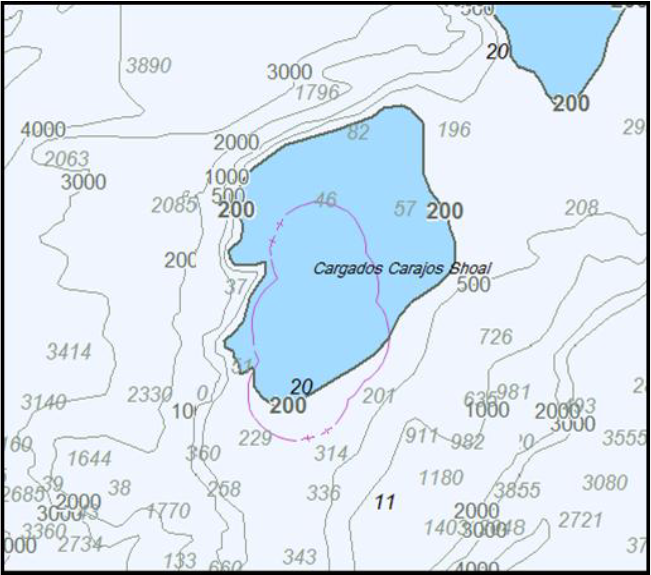 Our NM tracings are a key part of this service as they allow you to quickly pin-point the position of any updates and accurately apply them to your nautical charts. On 10 July we released a new tracing style that will make these updates easier to understand and apply to your portfolio of charts. How have the latest Notices to Mariners Tracings changed? We have changed the way we present updates on the tracing itself. For example, all information that needs to be inserted will now be shown in its exact position, rather than appearing in a box​ and arrowed in. Below we've included examples of these changes. All information that needs to be deleted will be shown with double strike through alongside a deletion symbol. Previously this information may have been boxed or hatched. All information that needs to be inserted will now be shown in its exact position on the tracing in relation to the chart. Previously this information was boxed, with its position shown as a small circle with a dot at the centre. Any new features will now be shown in its true position on the tracing and will be accompanied by the words 'in lieu'. Previously any information that needed to be amended would have featured a double strike though with new information arrowed 'in lieu'. Any information to be moved will be shown in its new position with an arrow drawn from its existing position. To help you recognise these new notations and use the new tracings, we have updated our 'How to update you Standard Nautical Chart' support films to include the latest tracing styles, as well as guidance on chart correction best practice. We also have a number of guidance documents that are available on the SNC page support tab and our Maritime Safety Information pages. 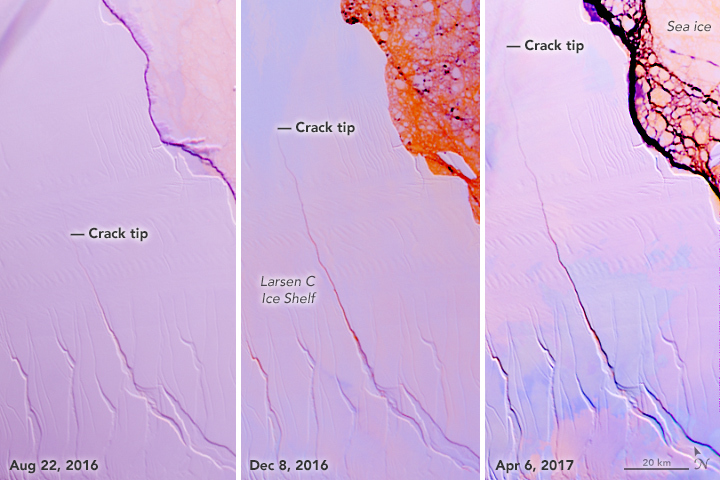 All eyes are on Antarctica’s Larsen C ice shelf as a deep crack continues to cut across the ice, leaving a huge chunk clinging on. When it eventually gives way, one of the largest icebergs on record will be set adrift. Even before the inevitable happens, ESA’s CryoSat mission can reveal some of the future berg’s vital statistics. 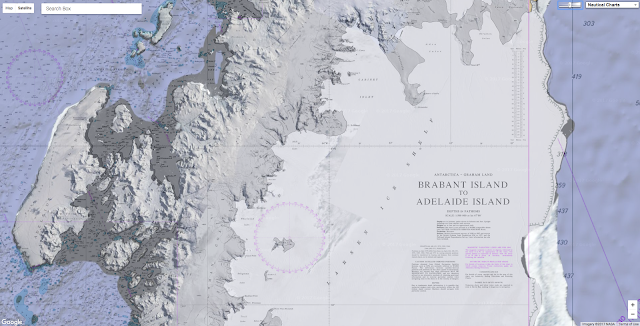 Six different satellite scatterometers are used to track icebergs around Antarctica. 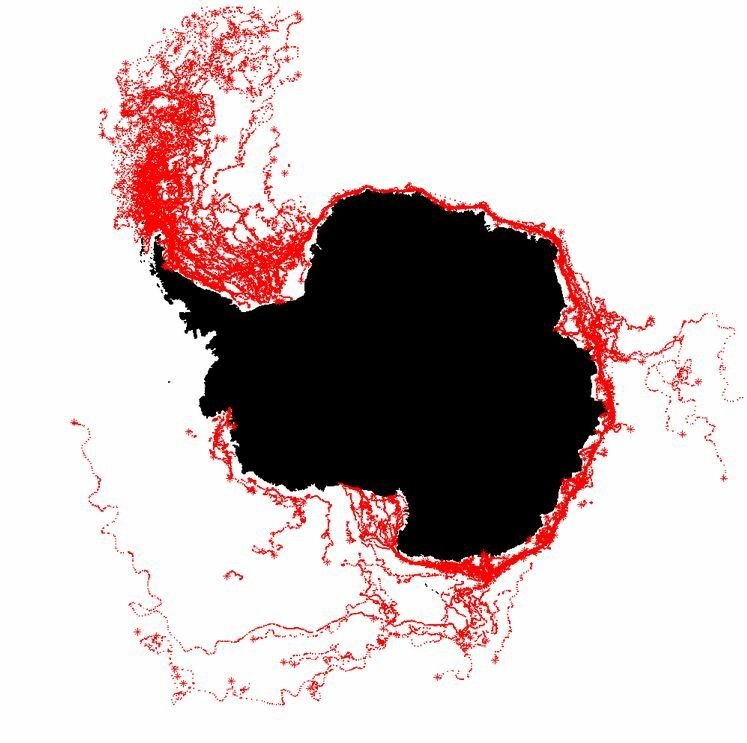 The image shows iceberg tracks from 1999 to 2010. 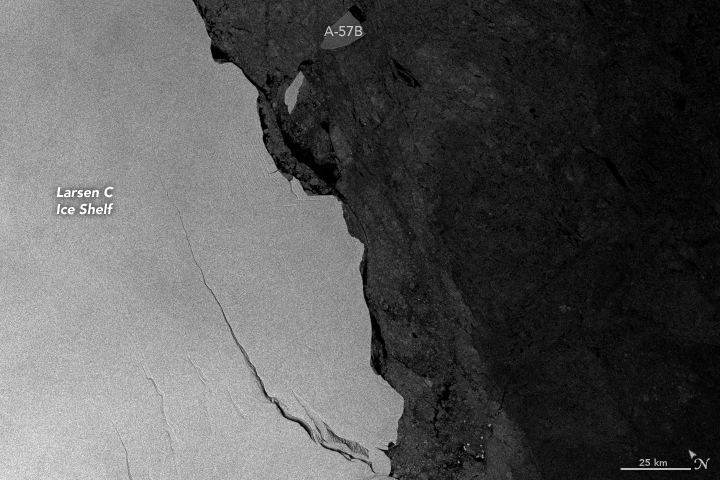 Monitored by the Copernicus Sentinel-1 radar pair, the crack in the ice is now around 200 km long, leaving just 5 km between the end of the fissure and the ocean. While we wait for Sentinel-1 to tell us when this 6000 sq km iceberg is spawned, CryoSat can reveal what the berg’s measurements will be. This Earth Explorer satellite carries a radar altimeter to measure the height of the ice surface. In general, this information is used to work out how the thickness of sea ice and land ice is changing and, consequently, how the volume of Earth’s ice is being affected by the climate. Noel Gourmelen from the University of Edinburgh said, “Using information from CryoSat, we have mapped the elevation of the ice above the ocean and worked out that the eventual iceberg will be about 190 m thick and contain about 1155 cubic kilometres of ice. in the Larsen C Ice Shelf, on the Antarctic Peninsula. Again, Sentinel-1 and CryoSat will play an important role in tracking the berg and keeping an eye on how it changes. UAV (unmanned airborne vehicle) flight along a crack in the Brunt Ice Shelf, which appeared. This was detected by scientists in October 2016. A berg, similar in size, drifted around the Brunt ice shelf in December 2015, causing alarm for those stationed at the Halley research base, which sits on the floating section of the shelf. 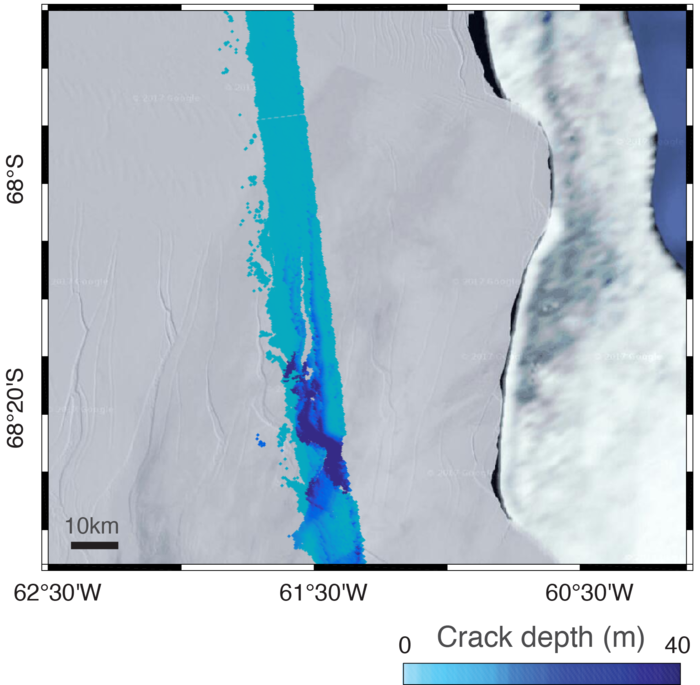 Anna Hogg from the University of Leeds said, “Measurements from CryoSat showed that the Brunt berg was around 390 m, so too thick to come close to ‘shore’ since the sea is shallow here. “As for this new Larsen C berg, we are not sure what will happen. It could, in fact, even calve in pieces or break up shortly after. Whole or in pieces, ocean currents could drag it north, even as far as the Falkland Islands. If so it could pose a hazard for ships in Drake Passage. 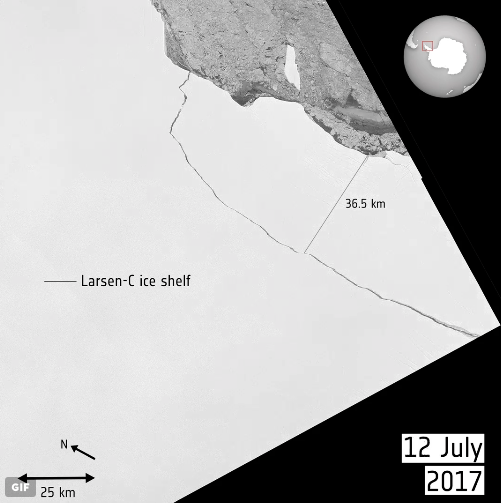 ESA’s CryoSat mission measured the depth of the crack in the Larsen C ice shelf, which led to the birth of one of the largest icebergs on record. Carrying a radar altimeter to measure the surface height and thickness of the ice, the mission revealed that the crack was several tens of metres deep. ESA’s Mark Drinkwater added, “Our historical effort to track large icebergs shows that those from the western Weddell Sea find their way out into the Antarctic Circumpolar Current or into the South Atlantic. The main purpose of CryoSat is to give us information to understand how ice is changing to improve our understanding of Earth. The value of having satellites built to deliver for science and missions like Sentinel-1, which are built to deliver for everyday applications, is enormous. In this case, the Copernicus Sentinel-1 mission and the ESA Earth Explorer CryoSat mission complement each other, giving us a powerful tool to monitor changing ice sheets. With an impressive track record of supporting maritime customers, the Schiebel Camcopter S-100 system has meanwhile been successfully proven on over 30 different vessels on all the world’s oceans, demonstrating its outstanding capabilities day and night, in all weather conditions, a proven track record that is unmatched. It is currently deployed with a number of important naval clients in conventional littoral reconnaissance roles; however, the Schiebel Camcopter S-100 has likewise proven to be hugely successful in the Search and Rescue role. Working with the NGO Migrant Offshore Aid Station (MOAS) in the Mediterranean, around 25 000 migrants have been found and rescued since 2014. The Handy Shipping Guide has written multiple times on the potential use of drones and unmanned aerial vehicles by the freight and logistics industry. Though many of these schemes go beyond science fiction into what can only be categorized as bizarre, there is no denying that use of these machines has a potentially revolutionary influence on aspects of the industry that might not get much of the limelight, but are of critical importance in the efficient and economic conduct of the industry. Today we have here the views of Martek Marine in a piece examining how Unmanned Aerial Systems (UAS) are finding ever greater uses in field of marine surveying and how this is impacting on ship operators and the maritime industry. Martek Marine is a major player in maritime drone applications. The company are currently working with a number of major classification societies, flag administrations and major ship operators helping them develop/refine their own UAS strategies to revolutionise their business and disrupt the market. The company has been awarded a 2-year Remotely Piloted Aircraft Services (RPAS) contract from the European Maritime Safety Agency (EMSA) as part of the world’s largest ever civilian maritime drone contract. The company had been awarded a previous €10 million contract by EMSA for ship engine emission monitoring using RPAS in November 2016. Reducing costs, enhancing processes, boosting safety and removing access challenges, these are just some of the benefits which these unmanned aerial devices more commonly known as drones can bring to the party. Originally developed for government and military use, as drone technology has progressed, UAS have been adapted to suit a wider range of applications and have grown in popularity within a relatively short space of time. Offering such a wide range of benefits, it’s not surprising that drones are now a staple of the marine industry. The extent to which drones are used in maritime applications is extensive and is now expected to surpass that of the defence industry within the next 5 years. The largest ever civilian maritime drone contact, valued at €67 million was issued in January 2017 by the European Maritime Safety Agency (EMSA). Drones will play a pivotal role in border control activities, search and rescue operations and monitoring of pollution, as well as the detection of illegal fishing and drug and people trafficking. The maritime drone industry is gathering momentum fast and drones used in marine surveying are at the heart of the revolution. So, how are drones used in maritime surveying and what does the future hold for drones within the industry? In the context of its Naval Innovation Days, DCNS has successfully achieved the coordinated deployment of three types of drone, underwater, airborne and surface, thanks to its I4®Drones mission system. It is the first time in Europe that a company has organized and implemented such a successful end-to-end performance. During this demonstration, it was possible to detect a suspect vessel, which was identified and neutralized in less than twenty minutes. In years gone by, regular visual inspections of cargo tanks and holds were performed by a person suspended on ropes to inspect the structure. Visual inspections focus on areas of high stress such as; stiffeners; brackets; bracing; webs and stringers and assessment of the coating condition and corrosion and damage within the tank. The sheer size of modern-day seafaring vessels however, means that access methods including staging, rafting and climbing are often used by surveyors to access tanks in order to carry out these observations. Costly set-up, long inspection times and a high level of personal risk for the worker are all drawbacks of traditional inspection methods. For the surveyor, inspections typically involve high rope access, working within a confined space and often for extended periods of time. In contrast, drone surveys have revolutionised the demanding task of inspecting ships' cargo tanks/holds. Before long, inspectors will wonder how they ever coped without drones in this compelling application of disruptive technology. 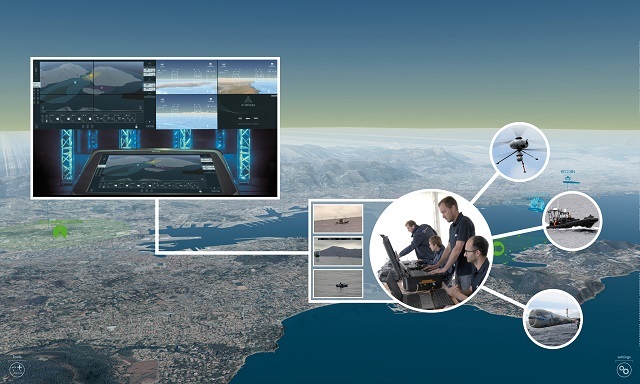 It's all been made possible by the development of UAS designed specifically for this purpose. Unique collision tolerant drones come complete with cameras and an integral lighting system. The systems can deliver a full HD video, along with still images for inspections in minutes, without the need for personnel entry into the tank or hold. Gone are the days wasting large amounts of time and money on staging and rafting, whilst exposing operators to major & unnecessary risks. UAS surveys slash the time to carry out cargo tank/hold inspections and offer high quality reports safely and typically at a fraction of the price ship owners are used to paying. Another key advantage to ship owners, is that by using a drone as opposed to conventional staging inside the tank, the risk of damage to the coating from staging is eliminated. Thanks to these benefits, tank surveys using drones are becoming increasingly popular and drone surveys are offered on all large internal tanks, on vessels such as Floating Production, Storage and Offloading (FPSO) units, bulk carriers and tankers. The largest players in the industry are already benefitting from UAS inspections; Chevron, DNV-GL, Maersk and BP to name but a few and it’s only a matter of time before others follow suit. DNV-GL, Lloyds Register & Maersk have all shown strategic intent to dramatically overhaul their operations by investing heavily in UAS technology and many other maritime operators are doing the same. Traditional methods of external vessel inspection can be expensive. Now that high definition, camera-equipped drones are widely available and at a more competitive price, using them for external vessel is a sensible option. Identifying substantial corrosion, significant deformation, fractures, damage, or other structural deterioration can be done quickly, easily and cost-effectively. External inspection involves a primary screening of the vessel by the drone. This identifies any Points of Interest (POI) that require closer inspection, without the need for any access equipment. To do this, the drone is flown over the surface of the vessel using an automatic flight control system controlled by a human pilot. The drone automatically captures survey data, such as video and high-resolution images during the flight. The survey data, in addition to payload data, is then transmitted to the system user, who then reviews the information to check for defects on the vessel’s exterior, such as peeling paintwork and dents. Acquiring data for external inspections takes a fraction of the time when compared against traditional methods and vessel downtime for inspection is greatly reduced. 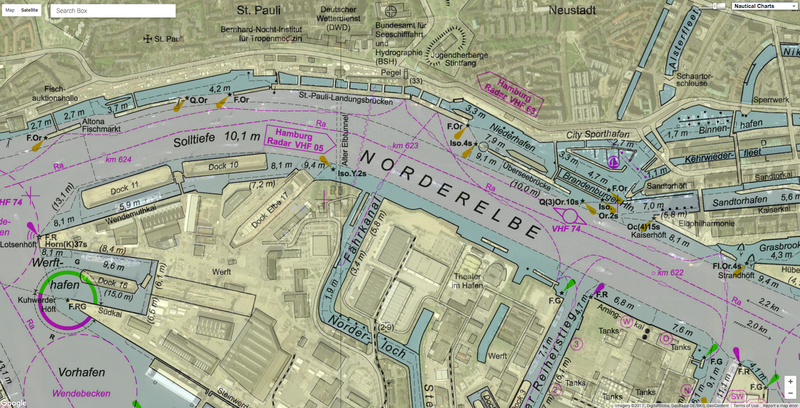 from water to land and seafloor coverage of up to 50 m water penetration. 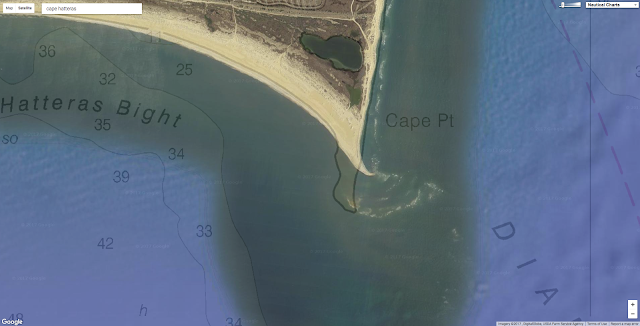 Bathymetric surveys gather important information about the features of water bodies and their shorelines which is fundamental to navigational safety. 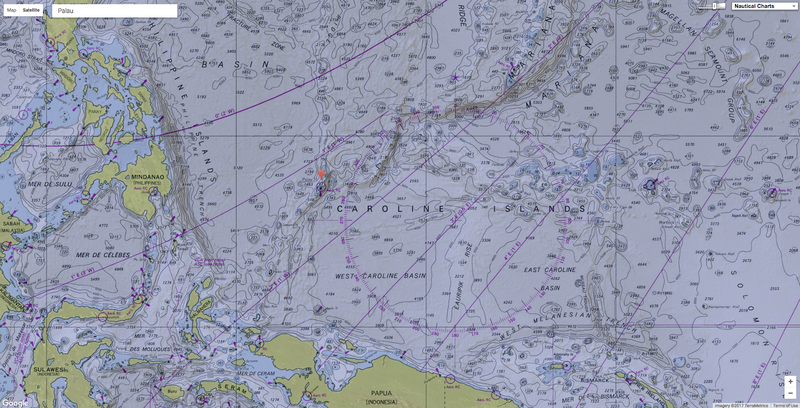 The information is then published for use on nautical charts, meaning it’s absolutely critical that this information is accurate and remains up to date. By measuring the time delay between the transmission of a pulse and its return signal, bathymetric Light Detection and Ranging (LIDAR), the same technology which many autonomous road vehicles employ, here is used to determine water depth. Analysis of these pulses is used to establish shoreline elevations too and is especially useful when shorelines are complex and rugged, where surface vessels cannot operate efficiently or safely due to rocks, kelp or breaking waves. A three-point sextant, fixed to mapped reference points on shore was formerly the method used by surveyors to aid navigation. Again the process was labour intensive and time-consuming and whilst the measured depths were accurate, they were often limited in number. Information between the soundings was missing, meaning seafarers would often be unaware of features on the sea bed and would not have the accurate depth information required for a safe voyage. Bathymetric surveys come at a high price nowadays. A LIDAR system will typically cost around € 880,000, not including the fixed wing aeroplane or helicopter to fly it. Bathymetric sensors developed for UAS are an emerging technology, allowing this type of survey to be carried out flexibly and at a fraction of the cost. Accurate data concerning bathymetry as well as environmental conditions in shallow waters, can now be acquired using these specialist sensors integrated into UAS. The latest technology has been developed to withstand storm force winds and heavy rain, snow and salt spray and, as technology advances, so does the duration of flight times, meaning more area can be covered in a smaller timeframe. UAS technology is therefore transforming bathymetric surveys. Maritime safety is drastically improved thanks to faster turnaround times and advanced data which enables more accurate and detailed nautical charts. As the development of new drone technology gathers pace, leading drone experts are suggesting that fully autonomous drones are the ‘next big thing’ coming our way when it comes to maritime surveying. As an advance this is really not dissimilar at all to a commercial jet flying on autopilot. Fully autonomous drones are pre-equipped with a 3D model of the vessel which allows the drone to independently work its way around the ship, stopping at points of interest to obtain more detailed video, or image data. Moving forwards, it would not be unrealistic to think that a UAS will be designed to create its own 3D map of the ship, before carrying out the survey independently, without any human input. 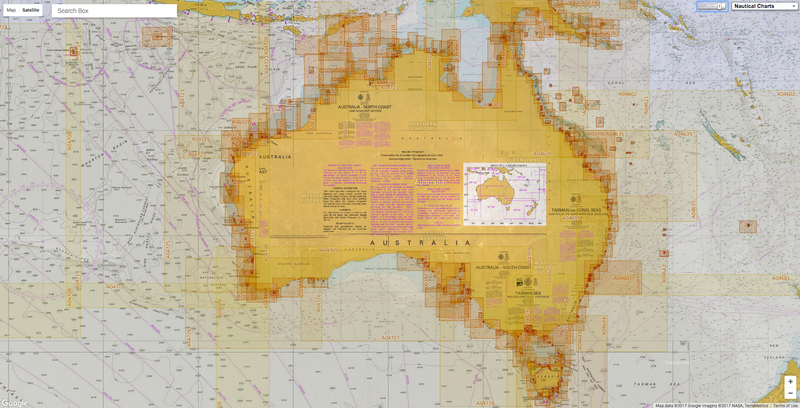 The Australian Maritime Safety Authority (AMSA) issued a marine notice, in order to draw attention to the importance of using only official nautical charts to comply with flag State requirements, under Chapter V of the amended International Convention for the Safety of Life at Sea (SOLAS). 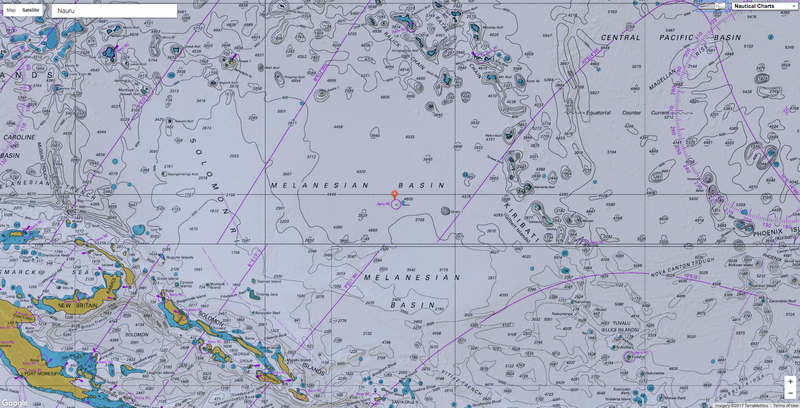 As AMSA continues to witness the use of unofficial paper and electronic nautical charts on board ships, it outlines that official charts are those issued by or on the authority of a government, authorised hydrographic office or other relevant government institution. 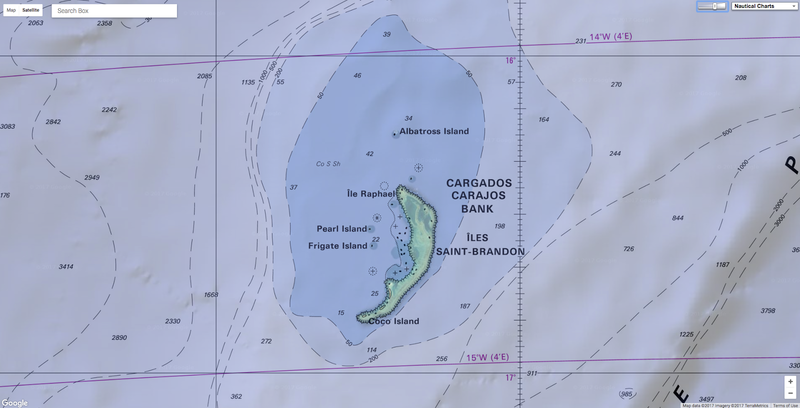 Unofficial electronic chart with reef, islands and obstructions missing. 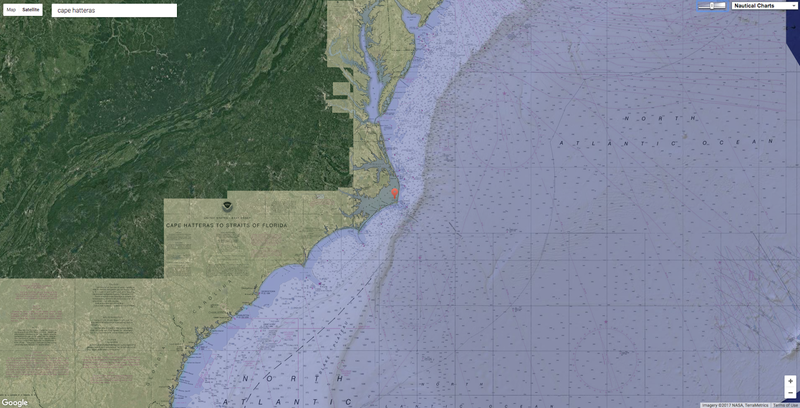 (defaulting to 200m instead of the missing 30m contour incorrectly suggests all lesser depthsare highlighted). 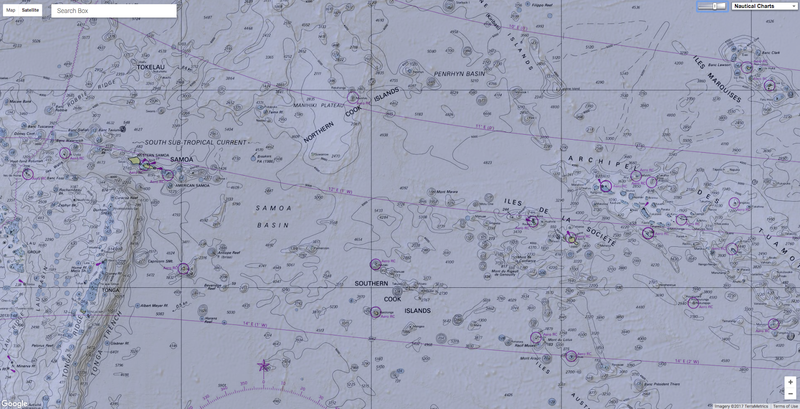 Note that the 11m obstruction is one of several not highlighted, the 15m obstruction is missing and a false 10m shoal appears to have been added. Same area (Cargados Carajos shoals) with official raster chart from SHOM from the GeoGarage platform. Official RNC with reef, islands, obstructions and depths all displayed correctly. Safety depth contour includes all dangers to navigating. 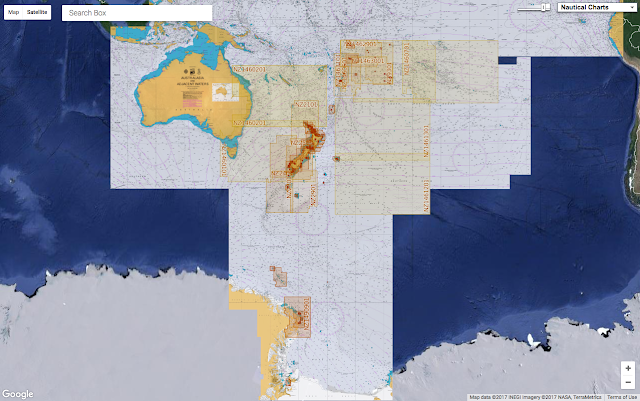 AMSA urges ship owners, operators, agents and masters to contact AHS, if they suspect that an ‘AUS’ paper or raster chart or an ‘AU’ ENC is not genuine, and provide relevant details. AHS will actively seek to stop the production and sale of unofficial copies of AHS products. AMSA also reminds that the carriage of up-todate nautical charts is critical to the safety of navigation, so it urges all purchasers, users, marine surveyors and recognised organisations to be vigilant in identifying unofficial nautical charts.